Homemade Caesar Dressing – creamy, garlicky, with Parmesan cheese in every bite. This dressing is SO EASY to make and only takes 10 minutes! Walk down the salad dressing aisle at your local supermarket and you’ll see a variety of different options. They look so colorful and pretty, especially in those beautiful designer glass jars. I’ve always found it difficult to find a store bought salad dressing that I really love, so I started making my own. Homemade Caesar dressing was one of the first. It’s creamy, lemony, garlicky, and mimics an authentic Caesar dressing. It’s so easy to make, and is done in less than 10 minutes. There are no eggs, mixing it is super simple! Give it a try on your next chicken caesar salad! I think you’ll love it. Using a medium bowl, combine the mayonnaise, anchovy paste, lemon juice, garlic, salt, pepper, Dijon mustard, Parmesan cheese, and Worcestershire sauce. Whisk until smooth and creamy. Place the dressing in an airtight container and store in the refrigerator for up to 3 days or serve immediately. The dressing will thicken as it cools. Use either shredded or grated Parmesan cheese. Shredded works better. Grated makes a thicker dressing. Use a garlic press or chopper for mincing/pressing the garlic. Go light on the salt. The cheese and anchovy paste add additional saltiness, so it’s easy to overdo it. Use a hand blender to mix the dressing. It works great! Looking for a great pasta dish to pair with your Caesar salad? Then take a look at our Homemade Chicken Alfredo! If you like this homemade Caesar dressing recipe, please leave us a comment and rate the recipe card. You can also find us on Facebook, Pinterest, Twitter and Instagram searching for Berly’s Kitchen! Homemade Caesar Dressing - creamy, garlicky, with Parmesan cheese in every bite. This dressing is SO EASY to make and only takes 10 minutes! Combine anchovy paste, lemon juice, garlic, Dijon mustard, Worcestershire sauce, mayonnaise, Parmesan cheese, salt, and pepper in a bowl and whisk until well combined. If using a hand blender, place all ingredients in a tall, slender container or jar and use the hand blender to combine. Store Parmesan Caesar Dressing in an airtight container in the refrigerator for up to 5 days. *Calories based on six 2 ounce servings. I love this post! 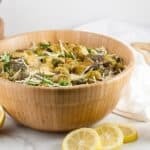 I am a sucker for dressing recipes and this one looks amazing. I can’t wait to try it ASAP… parmesan and garlic yummmm. It looks like an easy recipe to make! Oh boy do I love Caesar salad. I could eat it every day. Thanks for this great dressing recipe! Thank you for the recipe! This looks so yummy and healthy! I love homemade salad dressings and this one looks extra tasty! Love all that parm! Thank you, Allison! Homemade dressings are great because you get to control what goes into them. Unlike store bought brands that seem to be laden with extra sugar. Lord knows if you’re going to add anything extra you go cheese, always cheese lol! Such pretty pictures!! This looks sos yummy! I love Ceasar salad – and good to know you can leave it in the fridge for a few days too – i’m cooking for one so i like making things that last a few days! Caesar Salads are my favorite, and this one looks great – flavorful, but not too heavy. Can’t wait to try it! I love any kind of dressing and enjoy making my own. This one looks so good! Caesar salad is my favorite type of salad, but sometimes store bought dressing isn’t that great. Thanks for the recipe–can’t wait to make some myself!